A potential buyer tries out a gun which is displayed on an exhibitor's table during the Nation's Gun Show on Nov. 18, 2016 at Dulles Expo Center in Chantilly, Virginia. Devin Patrick Kelley, the shooter who killed 26 people in a Texas church, was court-martialed in 2014 while in the Air Force for domestic assault after he beat and choked his wife and fractured his infant stepson’s skull. He also sent threatening text messages to his mother-in-law, authorities said. He’s not the first mass shooter with links to domestic violence. The California man who killed four people and wounded 10 in a Tuesday shooting rampage in rural Northern California first killed his wife a day earlier and hid her body under the floor boards of their home, investigators said. "The majority of mass shootings are domestic or family violence events, where a mass shooter shoots (or) targets his intimate partner and/or family members," April M. Zeoli, an associate professor at the School of Criminal Justice at Michigan State University, said by email. In more than half of mass shootings between 2009 and 2016 the perpetrator shot a current or former intimate partner or family member, according to a report by Everytown for Gun Safety, an organization working to end gun violence. That 54 percent does not account for those who, like Kelley, had a history of domestic violence and went on to kill strangers. Sixteen percent of attackers in the mass shootings studied had previously been charged with domestic violence. Federal law bans firearm possession by domestic violence offenders in two ways: prohibiting an individual who is under a restraining order for domestic violence, and prohibiting someone who has been convicted of a misdemeanor domestic violence crime from purchasing or possessing firearms. But vaguely written laws, ineffective implementation and gaps such as private sales and the so-called "boyfriend loophole" often allow domestic abusers who shouldn't be allowed to possess guns to have them anyway. The federal law regarding domestic restraining orders has significant holes in it, Daniel Webster, who has studied the topic with Zeoli and serves as director of the Johns Hopkins Center for Gun Policy and Research in Baltimore, told NBC. "It does not include temporary or emergency orders, and honestly that’s the most dangerous time for victims," Webster said. Furthermore, the law only applies to current restraining orders, most of which only last for one year. People often don't renew them. "So you can have individuals who might have had several restraining orders for pretty serious acts of domestic violence, but all of those orders have expired," he said. Then there is what is called "the boyfriend loophole," which means the law only applies if the victim and the perpetrator are married, formerly married, have lived together or have children together. "In this day and age, the vast majority of domestic violence occurs in other kinds of contexts: dating partners, for example, and so this so-called boyfriend-girlfriend loophole is a very important gap in our federal laws," Webster said. 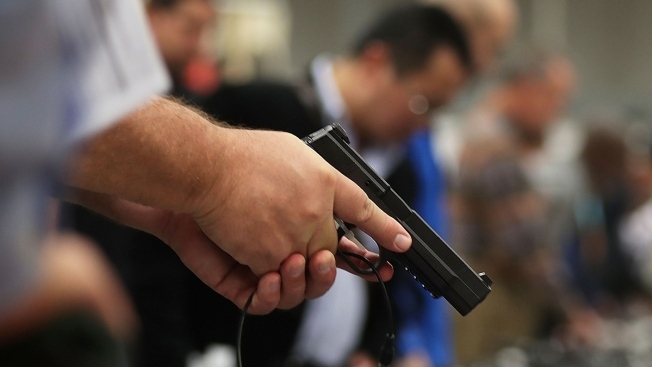 Another issue is that even when individuals are prohibited from buying or possessing a firearm, they can sometimes still keep a gun they already own. "At the federal level and in many states – it sounds a little bit illogical, and it is –they will say someone is prohibited from possessing a firearm if you meet one of those conditions. But they won’t actually compel a person to hand over any gun that he possesses," Webster said. Some states have passed their own laws to close loopholes in the federal laws, such as extending the definition of domestic violence to include dating partners. Multiple studies have confirmed that state laws prohibiting those under domestic violence restraining orders from buying or possessing a gun is associated with lower homicide rates between domestic partners, Zeoli noted. But these laws must be properly implemented and enforced to be effective, which Zeoli said is not always the case. "In order to prevent purchase, the disqualifying record (whether a domestic violence misdemeanor conviction or domestic violence restraining order) must be in the background check system," she said. "If it isn't, the purchase will go forward. So, we clearly need to focus on implementation." 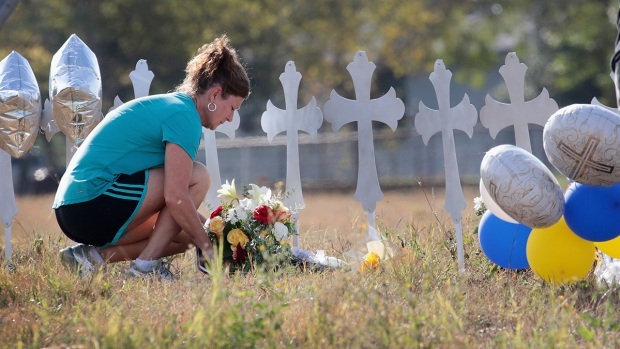 Kelley, the Texas church shooter, was able to buy a gun because the Air Force failed to enter his domestic violence conviction into a national database so that it would have showed up on a background check. When Kelly purchased the rifle he used to carry out Sunday's mass shooting, he checked the box indicating that he did not have a disqualifying criminal history, CNN reported. House Speaker Paul Ryan said Tuesday that Kelley should not have been able to get a gun after being convicted of domestic abuse. More needs to be done to enforce the "laws on the books," Ryan said. But even if an individual has a domestic violence conviction or a restraining order that would be revealed in a background check, he or she might still be able to purchase a gun. Under federal law, licensed firearm dealers must conduct a background check to sell a gun. But private sales, including those on the internet and at gun shows, do not require this step. And while some states have legislation requiring background checks even in private sales, many do not. "What this means, in practice, is that in many states, a person who can't pass a background check can buy a gun from a private seller without one," Zeoli said. In more than one-third of mass shootings, the shooter was already prohibited from possessing firearms at the time of the shooting, according to Everytown. In Webster and Zeoli's joint research on the nuances of policies that aim to keep guns out of the hands of domestic violence offenders, one of their main takeaways was that the way laws are written matters. "Distinctions matter," Webster said. "We find in remarkably consistent ways that the broader and more robust the laws are to disarm domestic violence offenders, the greater effect we see in reductions in intimate partner homicide." It is difficult to say whether keeping guns away from domestic violence offenders could reduce mass shootings, partly because up until recently mass shootings were much more rare events, Webster said. But because even Republican-dominated states with many gun owners have been strengthening their laws regarding domestic violence offenders and firearm possession, he is somewhat optimistic that progress can be made in addressing the weaknesses in the current laws. And depending on the strength of the laws, he guesses there will be an observable impact on mass shootings, he said. While the nation is polarized on aspects of gun control such as bans on certain types of firearms and ammunition, it seems that people are more united about keeping guns away from domestic abusers. Eighty-three percent of Americans support preventing sales of all firearms to people who have been convicted of violent misdemeanors, including domestic assaults, according to an internet survey of registered voters conducted by Morning Consult. Most Americans – 84 percent – also support criminal background checks for all gun purchases, according to recent polls. Gun rights groups take the opposing view on many of these issues. When Rhode Island moved to pass its own law making it harder for convicted domestic abusers to buy guns and requiring that they give up guns they already own, the National Rifle Association called it a "gun confiscation bill masquerading as 'domestic violence'" and called for action from its members to try to stop the bill. The bill passed in September. "As we have repeatedly stated, domestic violence is an abhorrent crime, but this bill doesn't protect domestic violence victims," the NRA’s Institute for Legislative Action wrote on its website. "Current federal and state laws are in place to make sure convicted violent abusers cannot possess firearms, and this bill is as dangerous as it is unnecessary." Erich Pratt, executive director of Gun Owners of America, a gun rights organization based in Virginia, said in an email to NBC that gun control costs lives and that women benefit from owning firearms to protect themselves in domestic violence situations. Still, studies have shown that having firearms in a household increases the risk of homicide and suicide for both women and men. A Harvard study found that of more than 300 cases of sexual assault reported in a data sample from the National Crime Victimization Survey (NCVS) from 2007 to 2011, none were stopped by the use of a firearm. Pratt noted that violent felons give up their rights to bear arms. But "federal law disarms both men and women for misdemeanor offenses –which means that couples who engage in shouting matches (where there is no actual violence) can suffer lifetime gun bans," he said. The law, often called “the Lautenberg Amendment” after its sponsor, Sen. Frank Lautenberg, defines a misdemeanor domestic violence crime as involving “the use or attempted use of physical force, or the threatened use of a deadly weapon, committed by a current or former spouse, parent, or guardian of the victim, by a person with whom the victim shares a child in common, by a person who is cohabiting with or has cohabited with the victim as a spouse, parent, or guardian, or by a person similarly situated to a spouse, parent, or guardian of the victim." The 1996 amendment extended the Federal Gun Control Act of 1968 to include misdemeanor crimes of domestic violence as well as felony domestic violence convictions, which were already covered. Gun Owners of America supports a repeal of the gun ban for all misdemeanor offenses, Pratt said. Misdemeanor convictions on a background check only prohibit gun possession if the crime is punishable by imprisonment of more than two years, according to the FBI's National Instant Criminal Background Check System website. Many misdemeanor crimes are punished only with monetary fines, and the maximum jail time for most misdemeanors is one year.